The childhood obesity epidemic first came to the forefront of medicine’s radar following the National Health and Nutrition Examination Survey III (NHANES) of 1994. It was noted at that time that the percentage of children whose Body Mass Index (BMI) was greater than 85% but less than 95%, the definition of being overweight, and more concerning, those with BMI greater than 95%, the definition of obese, had been steadily rising since the last Census in 1980. The number of children 6 years and older classified as overweight or obese had doubled between the 1980 and 1994 Surveys, and further, nearly tripled from the 1980 baseline by 2006. Since that time it appears that the percentage of overweight children has finally stabilized, but here in Utah, it is still over 30% higher than the decade prior. Our children are still at risk, and we must, as a community, continue our efforts to improve upon this trend, as children who are obese are more likely to have complications of obesity as an adult. There are likely many factors which brought us to this point. Childhood obesity has tracked adult obesity patterns, likely indicating changes in social and dietary habits. 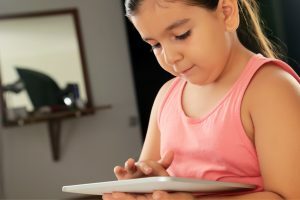 Technology has become ubiquitous in our daily lives with the ready availability of phones, tablets, video games, computers and televisions, often taking the place of our previous more active lifestyle, with an average amount of screen time of 7 hours per day for our teens. Time has also become more challenging to manage, discouraging healthier practices such as eating together with home cooked meals. The availability of cheaper, calorie dense processed foods and drinks, along with increased portion sizes and reduced dependence on healthier more natural food choices, have made our daily caloric intake jump along with a concomitant decrease in our daily activity. In addition, safety and environmental issues may play a role in some children’s ability to enjoy outdoor activities, with unsafe streets and poor air quality affecting a greater number of children in our communities today. These factors all combine to create a perfect storm, so to speak, resulting in the current epidemic and its associated complications of obesity, including Type II diabetes, heart problems, asthma, bone and joint problems, sleep problems, and social and psychologic problems. Fortunately, there is much that we can do to create healthy habits at home. Lifestyle changes such as improving diet, sleep and exercise. These include eating together as a family at meals when possible. Limiting liquid calories, including milk, juice, pop and sports drinks (the mantra that my patients know all too well) while increasing their water intake. Eating healthier, more natural, home prepared meals and snacks and limiting access to unhealthier processed or high calorie dense foods. Encouraging physical activity and limiting screen time for children, along with appropriate technology modeling behavior by us as parents, by becoming more active and limiting our use of technology when around our children. Creating technology free zones, such as the dinner table and bedrooms. For more information, check out the highlighted links and our Patient Education Handout: Childhood & Adolescent Healthy Living. Ultimately, it comes down to eating healthier, with a more natural, lower calorie density diet, along with meeting a child’s physical activity and sleep needs. Talk to your child’s provider during their infant/toddler Well Care Appointments or your child’s annual Well Child Check about what measures you and your child can take to ensure your child’s success in making lasting healthy life choices.